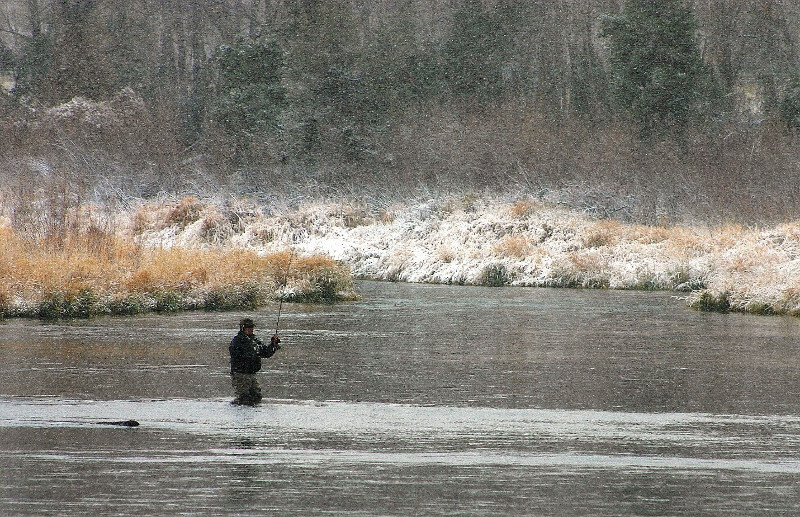 Fly Fishing - Fly Anglers OnLine, Your Complete Internet Fly fishing	Resource. "“May go fishing all their lives without knowing that it is not fish they are after”." The time was the last week of September 2018 and the place was a small lake somewhere in Montana. [You didn’t think I would tell you exactly where did you?] The weather was cool, the high in the mid-50’s, partly cloudy and somewhat windy. The fish in this photo was one of about 15 or so trout that I caught that day; mostly rainbows with one very respectable brook trout. They were all 16 inches or better. The largest, a nicely colored rainbow was just over 21 inches. I missed a week of fishing to be at Sow Bug. I had a great time there and learned some new things, and I found a few patterns that I want to try. It had been several weeks since I had been on the waters back home, and to say I was anxious would have been an understatement. With a flash flood only a month removed, the fact that changes could have occurred should have been 1st on my mind. As I drove down the access road and turned to cross the spring, I noticed it appeared that nobody had been through there in a while. But nothing really registered. Rigging, I did look out and notice that the stream appeared wider, and the hole below was far less defined than normal. Still nothing. For some odd reason, I grabbed my wading staff. Odd for me on this stretch? It wasn't until I was 20 feet from the bank in waist high waders, my feet barely holding ground, and my wading staff humming and vibrating like a suspension bridge cable in a hurricane. That is when it hit me. Things had changed. I was not going to be able to turn around. So, it was either get across or get wet, as each newly created channel challenged me as I crossed. Miraculously, I found myself dry, but exhausted and stumbling my way through the gravel on the far side. Pushing reality out of my head, that on the return trip my weaker side would be downstream. It was a thought that I really was not prepared to deal with just yet. Until then, I would fish.